Identical twin astronaut brothers, one preparing for a year-long mission aboard the International Space Station and the other a retired four-time shuttle flier, are offering to serve as proverbial lab rats for scientists interested in probing microgravity’s impacts on a genetic level. Scott Kelly, who already has made one long-duration flight aboard the station, is slated to blast off in 2015 for what will be NASA’s first year-long stint. Combined with two earlier shuttle missions, Scott Kelly already has amassed a total 180 days in space. That’s more than three times the cumulative 54 days in orbit logged by his twin, Mark Kelly, who left NASA after commanding the final flight of space shuttle Endeavour in 2011 to tend to his wife, former Arizona congresswoman Gabrielle Giffords, who survived an assassination attempt in January of that year. With Scott Kelly on tap to add another 365 days to his space calendar, researchers got the idea that the brothers’ identical genetics might provide a unique opportunity to learn more about how microgravity impacts the human body on a level not previously studied. “A study like this is going to be mostly observational, just see what we can find out. It’s not the kind of research that we in the human research program normally like to do,” chief scientist John Charles, with NASA’s Johnson Space Center in Houston, told Discovery News. “We like to do the things that are goal-oriented and have a specific outcome expected so we can use the information to advise engineers how to design better rocket ships and so forth,” Charles said. Initially, Scott Kelly raised the topic as he prepared for media interviews after being named the U.S. crew member for NASA’s first year-long spaceflight. Russian cosmonaut Mikhail Kornienko will be flying with Kelly, though he will become the fifth Russian to spend a year or longer in space. “I was sitting in a room with a few other folks, sort of going through some questions (Scott) might get and giving him some idea of what answers he might offer,” Charles said. “Scott asked ‘what if somebody asks me about the twins thing?’ and I said ‘I can’t imagine how that might be of any real usefulness, so let’s not worry about. It’s a non-issue,” Charles said. Later, when Charles said he laughingly told his colleagues about the idea, they took it seriously. “They said, ‘Well, wait a second, there might be something to that.’ So I got to eat crow, and tell Scott, ‘We’ve thought about it and actually it’s a bad idea, if we understand what the limitations really are,’ ” Charles said. Researchers do not know what they may learn. “This is sort of our first foray into the genetic aspects of spaceflight. This really is the wave of the future, and it’s not all that new, but it is new to my way of thinking,” said Charles, a physiologist. “The opportunity was suggested by the fact that we have twins, but the opportunity will not be limited to the twins,” he added. “Since we are all humans and we all have certain genes in common, there may well be insights that can be gained that have not been investigated yet,” Charles said. 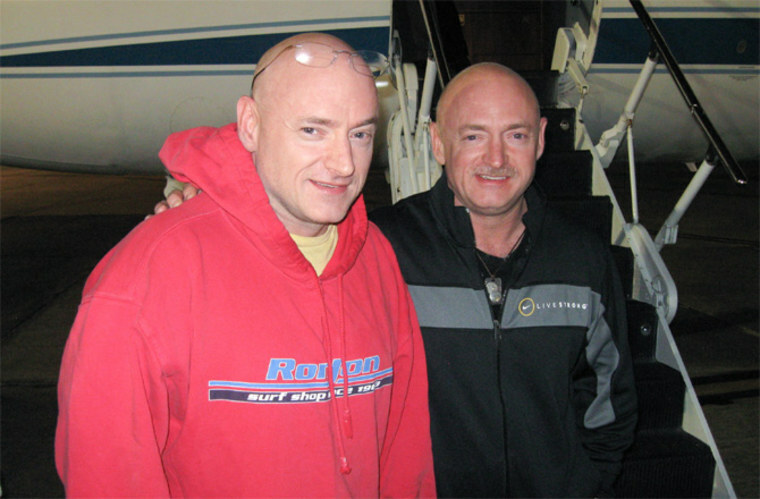 The idea behind using identical twins as subjects is that researchers will have one brother flying and the other on the ground for comparative studies on genetic changes that may be impacted by microgravity. The Kelly brothers turn 50 on Feb. 21, about a month before Scott Kelly is slated to launch. “The way we wrote the proposal is essentially anything that researchers think is relevant to understanding the genomics and proteomics and metabolomics and other ‘omics’ that can be deduced from a study of one astronaut in flight and one astronaut who is retired and not flying and living the good life in Albuquerque,” Charles said. “Mark said he’d come to town several times a year (for studies) and I imagine that will be co-incident with the times that we make measurements on Scott in flight,” Charles said. “I’m hopeful that most of this can be done with blood that will be drawn or with things like questionnaires and surveys. That would be the easiest to implement, but we are prepared for any kind of suggestions that the scientific community present that do pass peer-review and do promise to illuminate the differences in homozygous twins in response to spaceflight,” Charles said. Proposals are due Sept. 17.